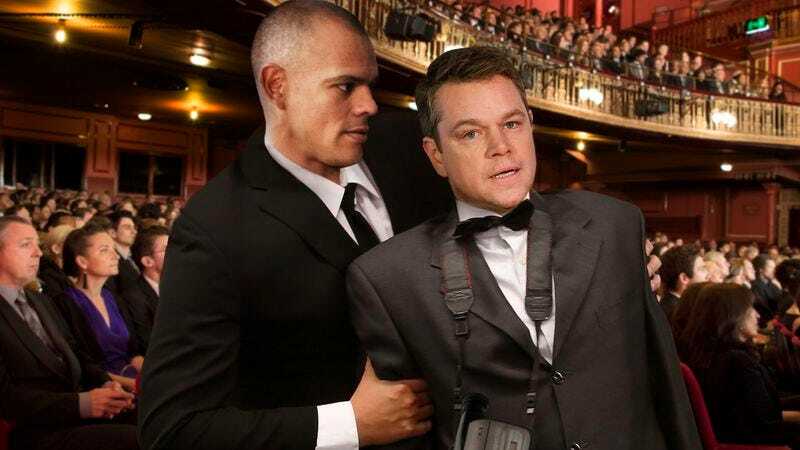 LOS ANGELES—Sending a message that there were no celebrities above the rules, a Dolby Theatre usher reportedly kicked actor Matt Damon out from the Oscars Sunday for attempting to film the ceremony with a camcorder. “He managed to film a bunch of awards before he got busted,” said actor Viggo Mortensen, adding that Damon nervously glanced over his shoulder at the attendees around him before discreetly pulling out a Sony Digital8 camcorder and carefully placing the device on his lap for a clear shot of the stage. “Apparently, he snuck it in here by tucking it inside his tuxedo jacket. He even had his finger over the red light so people couldn’t see that he was recording. He might have gotten away with it if the broadcast hadn’t cut to him right as he was putting in a fresh tape.” At press time, sources confirmed that 47 minutes of grainy footage from the ceremony had been uploaded to YouTube by user HollywoodInsider70.